By Jeff Greenwald, M.A., MFT. Interclub play in some European nations is unlike anything in the United States. The level of play is extremely high; matches are fiercely contested and draw large crowds of supporters. Clubs woo players with money and free housing and often cars – results really matter. German clubs, especially, care greatly about the success of their teams. 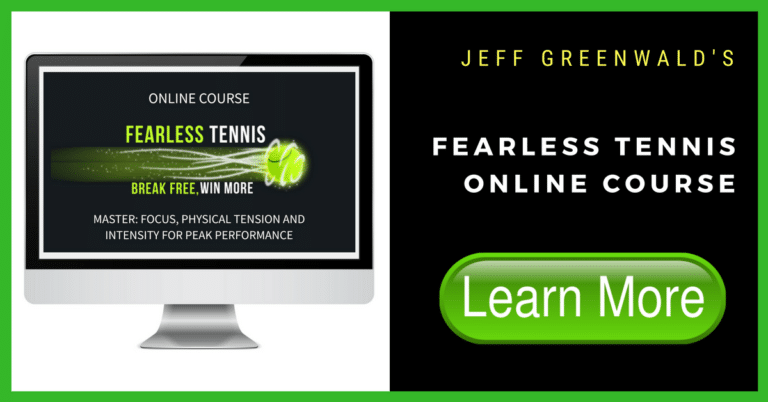 Here, former tour player Jeff Greenwald, now a sport psychology consultant based in San Francisco, provides an insight into this highly competitive club tennis environment. I was back at the Uhlenhorster Hockey Club in Hamburg, Germany (I had worked there from 1993-1995 as a junior coach and as the designated American player on the club’s tennis team) to conduct a half-day mental training seminar, in German, with members of the Club’s junior program. Exhausted when the session was over, I looked forward to a relaxed rest of the day. Not so fast, I was told. A key player on the Club’s team was injured. Would I play for the Club in his place? I hadn’t hit a tennis ball in over three weeks, hadn’t played competitively for more than three months. I had with me only one racquet worthy of match play, and three loosely strung demos that had seen better days. I didn’t even have tennis shoes. Yet I could not let the Club down. The match was against club’s fiercest rival and the stakes were high. The Club badly needed a victory. I bought a pair of sneakers at the pro shop. Match time could not have presented a more challenging scenario. There were the expectations of the Club management. Former team members and colleagues were in the stands. And to add even more angst to an already pressure packed situation, my fiancée was there, with her parents and friends no less. With the match slipping away, I finally faced a match point against me at 5-3 30-40, my first defining moment. I sprinted from side to side getting every shot back, fought him off, and saved the match point. After that point, I began pulling out the Jimmy Connors within me – pumping my fist to the crowd, getting really competitive. And I won the game! But he was still up. At 5-4, we had a long game and some good rallies. But again, he forced match point. And again, we had side to side, long rally. He went for a drop shot on his forehand side, I sprinted to the net, and cranked a ripping, topspin forehand down the line to stave off the second match point against me. The crowd went wild. For me now, it was a familiar battle. I had been in this situation on the Tour many times before – down and nearly out and I have lost far too many for my taste. I just could not lose this one, not here, playing for my old club, with so many people counting on me. At 5-5 I began playing more aggressively with my forehand, finally dictating a bit more and I came back to win the set 7-5. I was exhausted but beginning to feel confident and still prepared to battle. As for my opponent, he suddenly looked like a candidate for my mental training seminar. He was an unhappy camper, and showing it. I was determined to win this match, and knew now it was possible. But, once again, it didn’t progress the way I wanted. At 3-2 he broke me. I held the next game but was still down 4-3. It was here I made the decision – to dictate more and take some risks. I needed to break out of my comfort zone. So, at 3-4 I took every serve and went for broke, hitting a string of unreturnable returns to break and even the score at 4-4. This helped in two ways: It made me relax a bit and gain control. It also startled my opponent. The momentum shifted. (Lesson 5: Impact of Momentum). For the first time in the match, I took the lead, at 5-4. But at 30-30 in the next game, guess what? I broke a string on my only racquet. It was not a good time for this to happen. I had to resort to my three backup demo racquets. I picked up the better of the three evils. I took a little pace off the next return and I won it. At this point my opponent yelled, “I can’t lose to an old man.” His emotions were running wild. Make no mistake about it. After almost three hours of play, I wanted to get off that court badly, but only with a victory. I wouldn’t accept anything less. I was definitely nervous; I could not bare losing after three hours of battling with my club counting on me. So I used my own advice and repeated the phrase about 10 times, “I am winning this match. I am winning this match.” And after another corner to corner rally I ripped a forehand to his backhand side and he blew it wide. I won. My arms went into the air, I pumped my fist to the crowd, and my fiancée, her parents, friends, and fellow colleagues gave me an indescribable, unparalleled moment of joy with their applause. The following discussion is focused entirely on the lessons learned, and ignored, during my mental and emotional experience on the court in the match described above. There may be something in it for you. All competitive players feel nervous in competition. It’s necessary to perform at your highest level. Players need to channel this nervousness (arousal) into each shot and point and perceive the nerves as a necessary adrenaline boost. Perception is critical. Focus on your strategy, step out of your comfort zone, and go for your shots. Every successful athlete uses routines before and during competition (visualization, music, stretching, and between point and pre-shot routines to relax and maintain intensity. Pre-match and on-court routines should be regularly performed in practice and competition to make them automatic. Routines such as bouncing the ball a set number of times, using personal affirmations before returning, visualizing desired shots, and focusing on your strings can be very effective. Fear of making errors is a common problem in competitive tennis. Under pressure, players revert to old playing patterns, typically sacrificing shot making and aggressive play for a more tentative approach. This choice, however, becomes a vicious circle in that the more tentatively you play the tighter and more nervous you feel – a recipe for an abysmal day of tennis. Instead of succumbing to this physiological experience, tell yourself you are going to turn the match around, begin going for your shots regardless of the result and allow yourself to make errors. Commit to playing loose and aggressively. This approach will free you up to play your game, to dictate points, and will ultimately change your experience on the court. Even if you don’t feel confident, fake it. The brain doesn’t know the difference. It’s easy to remain focused and confident when you are playing well. However, the challenge and opportunity to raise your game comes when you run into difficulty. With the right mental approach, players can minimize the off days and improve their average performance considerably. The first key is not to panic when one’s best shots seem to be buried somewhere out of sight and out of reach. Remain calm, use self-affirmations, and rationally evaluate the situation. This is the time to consider expanding your awareness beyond the technical difficulty and try new things – change your tactic, assess your tension level, and find a way to rediscover your rhythm. Typically, players overreact quickly (often, even in the first game), change their game plan and racquets, dart around the court with their eyes, and begin trying to use all of the information they received in their last weekly lesson. This is where most players unravel in matches. And it is here that players can make tremendous progress. By breathing deeply from the stomach, recalling one’s best performances, making new decisions, smiling, keeping the eyes focused on specific stimuli (i.e., ball, target, etc), and focusing on one shot at a time, players can considerably improve their average performance. Err on the side of stepping back and relaxing versus trying harder. Jeff Greenwald is an internationally recognized sport psychology consultant and licensed therapist. He is a speaker, author of The Best Tennis of Your Life and a former world-ranked pro on the ATP Tour. Jeff went on to reach the No. 1 ITF ranking in the world and U.S in the men’s 35-age division. He is now a leading expert on the mental game of tennis. © 2018 Jeff Greenwald. All Rights Reserved.